And mindfulness at work doesn’t mean trading suits and spreadsheets for peacock-patterned leggings and kombucha tea (though I’m a fan of both). It simply means finding ways to become more aware, tapping into our reserves of creative leadership and compassion, and then practicing these skills. Because it’s always a practice. Mindfulness is not only “on-trend.” It’s an ancient principle, as relevant today as it was thousands of years ago. It can help us grow more attentive, creative, resilient, and successful. In doing so, it can create ripples of awareness and positivity that will reverberate through our communities, our society, and our world. This is why mindfulness is not only cool, but crucial for the future of our society. As Richard Branson says, “Let’s do business like there is a tomorrow.” But to create a better tomorrow, we must start by being more mindful today. Flynn Coleman: Yoga, Meditation and Mindfulness: “Trends” That Could Change Everything. Meditation not only calms your mind and reduces stress, but reduces the risk of heart attack and stroke. Here’s everything you need to know to get started. A November 2012 study conducted by Robert Schneider, M.D., director of the Institute for Natural Medicine and Prevention and dean of Maharishi College of Perfect Health in Fairfield, Iowa, showed that subjects with heart disease, who practiced transcendental teditation regularly for five years were 48 percent less likely to have a heart attack, stroke or die from all causes, compared with those who attended a health education class in lieu of yoga. “It appears that transcendental meditation is a technique that turns on the body’s own pharmacy — to repair and maintain itself,” said Schneider. He also adds that transcendental meditation may reduce heart disease risks for both healthy people and those with diagnosed heart conditions. Want to try meditation, but not sure where to start? We asked meditation teacher Jeanne Ball to share her tips on how to begin and what to expect. 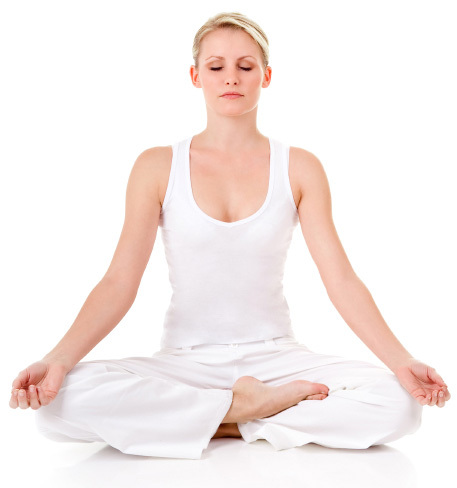 SheKnows: What should a person do physically to prepare for transcendental meditation? Jeanne Ball: A person doesn’t need to do anything to prepare for the TM technique, except sit comfortably and close the eyes, because with this particular practice one quickly, naturally transcends the physical environment and dives deep within the mind to enjoy inner silence, peace and expanded wakefulness. It’s nice if there’s a quiet environment, though not essential. One can effortlessly practice TM in an airport, in the same house with kids running around, or at the office during break. The deeper reason why no preparation is necessary is because the technique is motivated only by the mind’s natural tendency that is always lively within everyone: the tendency to seek greater happiness. During TM, there’s no outside preparation or internal effort required, because attention settles inward spontaneously, drawn by the mind’s own nature, to fields of greater happiness and dynamism, and there’s no obstacle to that natural inward progression. SK: What should a person think about while they’re meditating? JB: Practicing the TM technique is very easy because the process doesn’t require you to think about peace or happiness or anything in particular. Nor does it involve controlling the mind or trying to rid yourself of thoughts. The technique is designed to effortlessly allow the mind to settle inward to quieter levels of thought in the direction of greater energy and happiness within. The mind naturally gravitates to its silent source of restfulness and goes beyond thought all together. SK: How do you help people let go of their thoughts during meditation? JB: If a person consciously tries to let go of thoughts, to get beyond thoughts or forcefully get rid of them, it’s called “straining in meditation” and usually only creates more thoughts and often causes a headache. That’s not the TM technique. With TM, we don’t control the mind, we satisfy the mind. The technique is designed such that thoughts are not a problem at all and the mind effortlessly settles into the silent, rejuvenating experience of pure awareness or restful alertness, in which all thoughts and mental activity have been transcended. SK: How long and how often should a beginner practice meditating? JB: Twenty minutes of the TM technique morning and afternoon is enough to balance a full day of activity and to dissolve stress and revitalize mind and body. SK: What benefits can someone expect to experience from meditation? JB: The same benefits that a tree receives when its roots are watered: every branch, leaf, fruit, stem —everything gets enriched. The founder of the TM program, Maharishi, used to say, “The only way to take care of the whole tree is to water the root.” This means: deep within everyone is a transcendental source of energy, creativity and intelligence, and if we can restore direct contact with that inner source by diving beyond thought and contacting our deepest inner self, then we will enrich all aspects of life in one stroke. People find their physical and mental health improves, their relationships become more harmonious, they have more energy and become more productive. Peace and happiness grows naturally from within. We find ourselves enjoying life more, and, as perception becomes clearer, finding more joy and beauty all around us. Quick tip: If you find it difficult to meditate on your own, try Headspace, a meditation app created by former Buddhist monk Andy Puddicombe. Headspace lets you try 10 days of 10-minute meditation exercises for free. For additional information and resources, Ball recommends visiting www.tm-women.org where you can read more about TM and women’s heart health. Say “Om” and meditate for heart health. TORONTO – Canadian women’s hockey captain Hayley Wickenheiser has tinkered with preparation techniques over the years to keep her game at the highest possible level. Now 34 and a veteran of five Winter Olympics, Wickenheiser has shifted away from the heavier weights she lifted in her younger days. She focuses more on functional strength training now, still does regular yoga sessions and has kept making improvements to adjust to the more speed-focused style on the ice. Wickenheiser also recently added meditation into the mix and it has made an immediate impact. “I’m a little bit more centred and I feel less anxious about trying to control outcomes in every aspect of my life,” she said. “Just letting things go. I think that’s a real key as an athlete is to control what you can and let go what you can’t. Wickenheiser tries to meditate for at least a few minutes each day. She closes her eyes, focuses on her breath and tries to get “truly present” in the moment. The veteran captain has found it reduces stress and she has noticed the effects on her performance. “I find it just settles me,” Wickenheiser said. “I can do it on the plane, I can do it walking around, you can do it anywhere. It’s just instant centring and brings you back to perspective. The Shaunavon, Sask., native also makes a consistent effort to get more rest than she did in her younger days. Wickenheiser has tinkered with her food choices as well, working gluten-free and organic options into her diet. It has all helped her stay in top physical form. Wickenheiser was in Toronto on Thursday for promotional work to support the Kraft Hockey Goes On program, which recognizes local volunteers involved in the sport in communities across Canada. The national women’s team camp is underway in Ottawa, the host city of the 2013 women’s world championships. Wickenheiser is instead focusing on other commitments this week, including her kinesiology studies at the University of Calgary and playing for the Dinos at the Canadian Interuniversity Sport level. Soon she’ll be focused on preparations for the world playdowns in April, when Canada will attempt to defend the title it won last year in Burlington, Vt.
And in just over a year, the 2014 Winter Olympics will begin in Sochi, Russia. Canada won gold at the 2010 Games in Vancouver and will be looking for a successful defence of that title there as well. “I think we’re in really good shape,” Wickenheiser said. “I think we’ve got a good group of core players and a middle group of players now that has one Olympics under their belt and has won at the Olympic Games and knows what that’s all about. via Women’s hockey star Hayley Wickenheiser works meditation into her routine.